Situated above Fortrose on Feddon Hill, the Old cemetery is relatively modern (about 1930s). 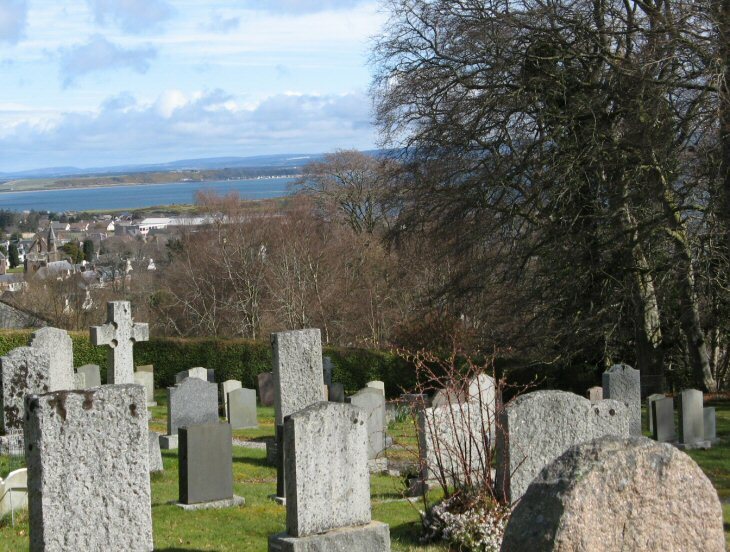 Prior to its creation, burials took place at Fortrose Cathedral, or, more frequently in the parish churchyard at Rosemarkie. Picture Added on 06 April 2008. I have a relative supposedly buried at Fortrose, Bernard Mackenzie, died 30 July 1713. Are there any records, tombstones or burial sites left of this vintage? Thanks for your photographs - they are beautiful. Added by Maggie Mackenzie-Goodman on 26 January 2009. Hello Maggie. If your forebear was buried at Fortrose in the 18thC, it is likely to have been at the Cathedral. According to a survey done by the Highland Family History Society in 2005, there was no Bernard Mackenzie stone noted within the Cathedral grounds. The probability is either the grave wasn't marked, or it has been 'lost' under the turf. Added by Roddie on 26 January 2009. I am trying to trace the tombstone of an American - Rev. John Dowdney - who was the minister of St Andrews Church in Fortrose and died there in 1865-6. I suspect he was buried in the Cathedral Cemetery. Added by David Kennedy on 13 July 2015.